A Hong Kong woman is convicted of beating and starving her Indonesian maid in a case that sparked international outrage. An Indonesian maid called Erwiana Sulistyaningsih wore a wide and hearty smile today as she left Hong Kong’s District Court and after everything she’s been through, she has good reason to feel satisfied. Here is Ms Erwiana’s story. She left her home in central Java in 2013 to find a job in Hong Kong as a domestic servant. She was paid just £328 per month to clean, cook and look after children and the elderly – but she thought it was the best way to help her family back home. A 44-year-old mother of two called Law Wang-Tang gave her a position but the next eight months for the Indonesian can only be described as a living hell. Ms Erwiana told the court that her employer beat her with mop handles, hangers and a ladder. On one occasion Law Wang Tang stuck the metal tube from a vacuum cleaner down her mouth and twisted it. The Indonesian maid said she was given only one bottle of water a day – to minimize toilet breaks – and was forced to sleep on the floor. “(Law) threatened to kill my parents if I told people about torture,” she said. Ms Erwiana eventually fled her employer and returned to Java, barely able to walk. Pictures of her battered and emaciated frame caused up an uproar, both in Hong Kong and internationally. The presiding judge said she found Ms Erwiana’s testimony credible, describing her as a simple village girl. “The fact that she believed (her parents would be killed ) shows that she is simple and timid,” said Judge Amanda Woodcock, who went on to dismiss Law Wang-Tang’s lawyer’s assertion that the Indonesian was trying to frame her employer and seek compensation. Law Wang-Tang was found guilty on 18 charges of 20 charges in all, including grievous bodily harm and criminal intimidation. Sentencing will take place on 27 February. There are 300,000 workers like Erwiana in the territory and their status as second class citizens is enshrined in law. They earn a fraction of the minimum wage, are forced to live with their employers and if they decide to leave, they are only allowed two weeks to find a new job. What’s more, they often carry large debts, owed either to employment agents or family members back home who stumped up the cash to get them to Hong Kong. All this means that maids are very unlikely to register a complaint against their employer in the first place. 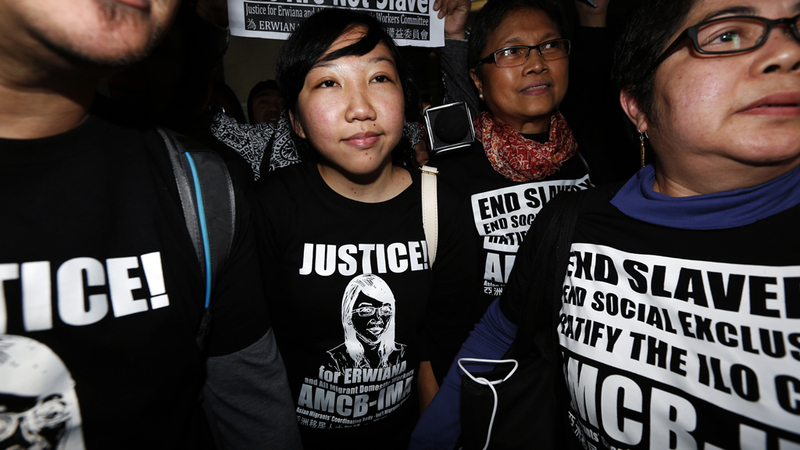 “It is quite remarkable that (Ms Erwiana) took her case to the courts,” says Roseann Rife.